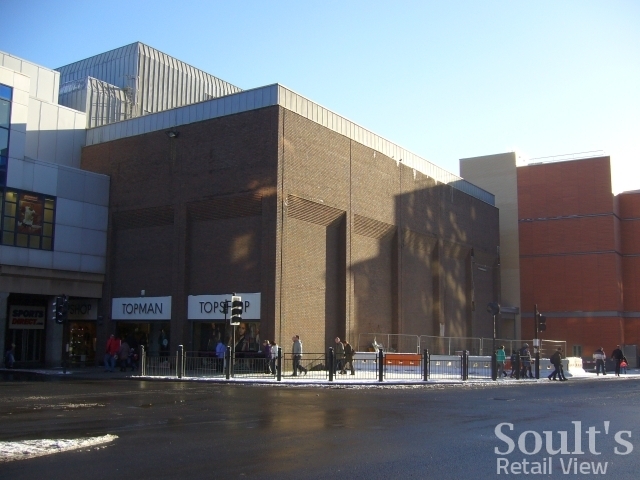 Following the apparent confirmation of earlier rumours about Next planning to open a new store in Newcastle’s Eldon Square shopping centre next year, it seems timely to take a look at the retailer’s current Northumberland Street premises, shown above. It’s quite a handsome building when you stand back and look at it – particularly in comparison to the brutish, blank, brown brick facades of the Primark (formerly C&A) and Bhs building next door. 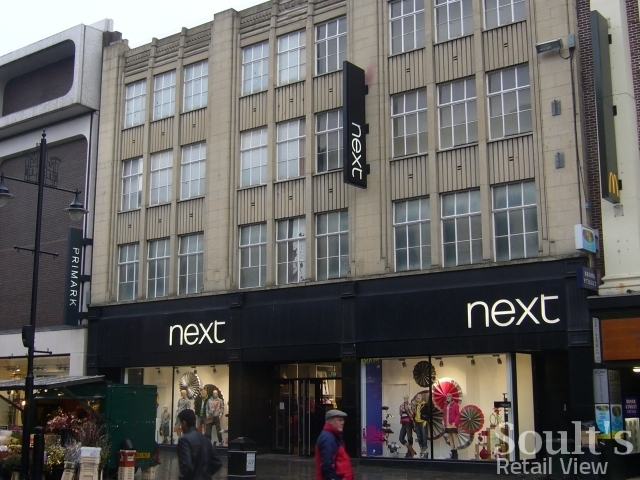 Imagine then how things might look if a building in the style of Next’s premises wrapped all the way round the corner into Northumberland Road, in place of the existing Bhs/Primark block… something like the view below, perhaps? Perhaps I should have known already, but before getting a copy of the fascinating new Newcastle Through Time book for Christmas, I hadn’t a clue that today’s Next building is a retained fragment of the building above – the remainder of which was demolished in the early 1970s to make way for more modern premises for the then ‘British Home Stores’ and C&A. I’m none the wiser, however, about which retailer was occupying the Next site at that time, or indeed what the reason was for retaining those three last bays. Perhaps someone out there can shed some light on the matter? One thing I do know is that the story has a neat, if slightly tenuous, link to a building mentioned briefly in one of my first blog posts – Murton House, in Grainger Street. 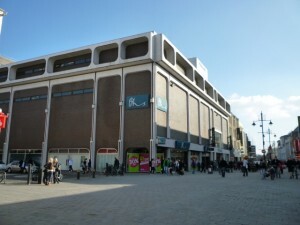 Having housed the Henry A Murton department store from about 1910 until its takeover by the Co-op in 1957, the Co-op made substantial changes to the interior in the 1960s, before moving out of the premises in 1971. 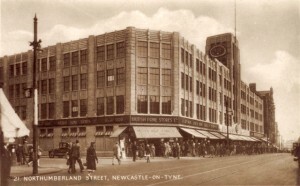 Conveniently, C&A was able to take the property over after only a short period of vacancy, occupying the building until 1973 while its regular premises in Northumberland Street were demolished and rebuilt. Similarly, British Home Stores apparently moved to Pilgrim Street during the redevelopment of the site – again, answers on a postcard if you have any information on where exactly that was. 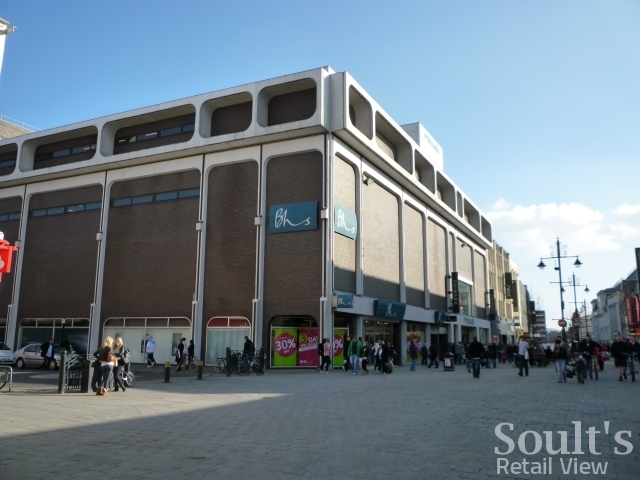 Take over a small amount of space occupied by Eldon Leisure in order to create space for a “flagship store”. The fact that Next will be nibbling into Eldon Leisure seems to reinforce the view that its intended location must be the current Arcadia Group space, presumably incorporating three floors – the street and mall levels (current Topshop), and the floor accessed by escalators from the mall that currently houses Topman (and, if I understand correctly, the adjacent bit of Eldon Leisure). This space equates to the whole of the brown-brick block shown in the photo above. However, with a reported £8m redevelopment budget, it has to be hoped that something creative can be done to get rid of those blank and lifeless façades – either by building out into the open space between it and the new St Andrew’s Way (the redbrick section to the right of the shot), or by punching some more openings into what is currently there. Remember Maurice Gerald at 6 Bigg Market, Newcastle? Thank you to everyone who has posted information about Wilson & Carter. My mother has been fascinated by all that you have posted though still doubts (at 86yo) of finding anyone still alive from when she was there. All the people we’ve tried to contact have died in the last couple of years. Still, it revived many memories and I am very grateful. Thanks for your recent comment about Wilson & Carter in Northumberland Street. I’ve done a bit of digging around, which I’ve written about at http://www.skyscrapercity.com/showpost.php?p=79868102&postcount=324. As I note there, I’ve come across a picture at http://www.flickr.com/photos/newcastlelibraries/4082005095/ which I believe shows part of the Wilson & Carter store on the left. Others in the forum have added further titbits. Hope that all helps!